Despite what a certain NBA superstar stated, if the NBA commissioned a basketball Mount Rushmore, it is hard to believe that Bill Russell would not be included. The former great was a pioneer in many ways and is a collecting favorite. Because of this, Bill Russell cards and autographs remain in high demand. 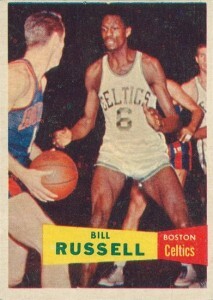 Shop for Bill Russell cards on eBay. Based on his career highlights, Bill Russell is in a league of his own. During his storied career with the Boston Celtics, Russell won 11 NBA Championships, five MVP awards, and was named to 12 All-Star games. 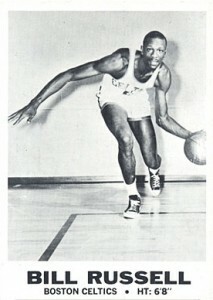 He also won two NCAA titles in college with the University of San Francisco. Somewhat surprisingly, the majority of Bill Russell cards and autographs are downright reasonable. Perhaps it is because he played during a period when basketball cards and the sport itself were still a novelty to many, or maybe it is because he is a center and big men generally do not get the same love from collectors. It is also likely that his autograph values have decreased because he has become a more common signer in his older age. Whatever the case, from a collector’s perspective, it is not necessarily a bad thing that you can track down an authentic signed card from one of the top players in the history of a basketball for less than $100. 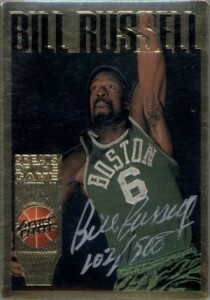 The following list takes a look at the top Bill Russell cards currently available for collectors. Vintage collectors have very few options because there were only two major products released during Bill Russell’s 13-year career. While many of his other cards and autographs might be easier on a budget, the sole Bill Russell rookie from 1957-58 Topps is not in that same grouping. The front-lit image with a background gives the impression that the game was being played in a darkened gym. Other than the action shot of Russell, the only additional feature of the card is a yellow and red text box displaying his name and team. Mid and high-grade versions can push well into the four figure range. Several years would pass before another NBA product would be available and this would be the last major release of Bill Russell’s career. Vintage basketball collectors should recognize the 1961-62 Fleer design because the product is filled with Hall of Fame rookie cards, including Wilt Chamberlain, Oscar Robertson and Jerry West. The simple layout, bold colors and black-and-white photo make for one of the most iconic designs of all-time. Although it is not the main Bill Russell card from the 1961-62 Fleer release, card #62 is equally popular and valuable with collectors. The 66-card set features 44 main cards, as well as a 22-card "In Action" subset. 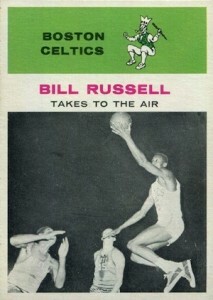 The design is virtually the same, except an action image of Russell is shown and the caption reads "Bill Russell Takes To The Air." 1968-69 Topps Test was the set that came before Topps' official return to basketball cards with the tallboy format used in 1969-70 Topps. The test issue set included 22 cards and is populated with plenty of Hall of Fame players. The simple black-and-white front design is a stark contrast to the design that Topps would use the following year and the backs of the card contain part of an image that can be combined to form a picture of Wilt Chamberlain. 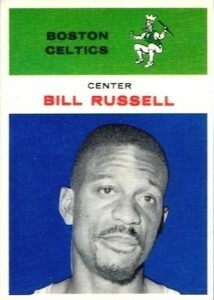 While the test cards rarely surface, the Bill Russell card is particularly rare. 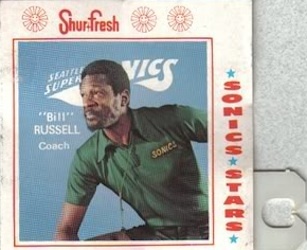 While it is not the typical card that pops to mind for collectors, the Seattle SuperSonics release from Shur-Fresh Bread presents a fun budget alternative for Bill Russell collectors. The cards originally came with the bread tab attached to the corner, but they mostly surface without it. 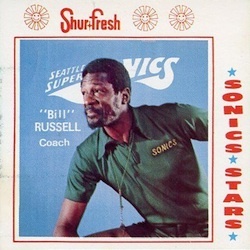 In the 1973-74 season, Bill Russell was in the midst of his first season as the head coach for Seattle. Unfortunately, the magic he displayed on the court for Boston did not translate to his coaching stint with the SuperSonics. A staple of early-1990's collecting, Action Packed produced a brief run of Hall of Fame basketball products. Most notable was 1995 Action Packed Hall of Fame, which included one HOF autograph redemption card per box. While the base cards are nothing special, the autograph set contained an impressive group of players, including the first autograph card for Bill Russell. Signed in silver and hand-numbered to 500, the gold foil card remains a popular option. Collectors should be aware that there is no base card for Bill Russell. 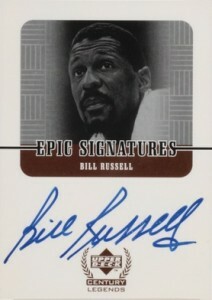 Nearly four years would pass before the Hobby saw another signed Bill Russell card. Epic Signatures from 1999 UD Century Legends was one of those options and offered collectors an on-card autograph with a classic design. There is also a rare jersey-numbered Century parallel, numbered to 6. Even though Exquisite was more celebrated for the valuable rookie cards found in each product, many Hall of Fame players populate the checklists. Among the most plentiful signed cards for Bill Rusell, Exquisite Uniforms featured an autographed jersey card, numbered to 100. 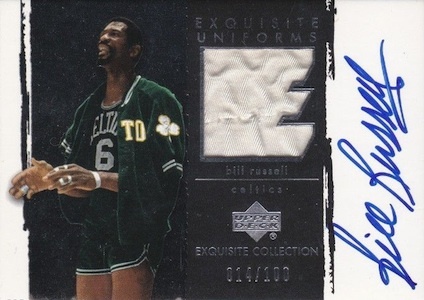 While specific Exquisite options for Bill Russell do not surface often, almost any signed Exquisite Bill Russell card will be a good addition to a collection. There are nice cards and then there are pieces of history. Despite coming from a modern product, this UB Black Octo Autographs card is a piece of history. 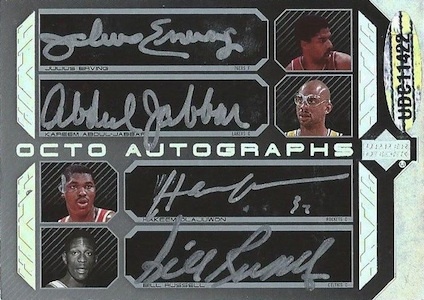 The multi-signed card features eight elite signatures, including Bill Russell, Michael Jordan, LeBron James, Magic Johnson, Larry Bird, Julius Erving, Kareem Abdul-Jabbar, and Hakeem Olajuwon. All signatures are on-card and signed in silver. The rare card is numbered to 10 and there is certainly no filer when you consider the autographs that are present. Both sides of the card can be seen below. Also, given the rarity of cards like this, they are not the easiest to track down. However, collectively, there are multiple options that pair Bill Russell with another elite NBA player. Part of the high-end movement from Panini in 2012-13, this Bill Russell Immaculate Title Winners features a trapped autograph and is numbered to 11, in honor of his personal number of NBA titles. 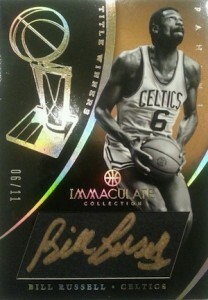 Again, several Bill Russell autographed options from both 2012-13 Immaculate and Flawless have proven to be popular. Bill Russell 2018-19 Panini Prizm Silver & Pink Ice Prizm Refractors! CELTICS!